EHS Combination specimen shipping system features Therapak’s standard small cooler (for frozen specimen section) nested underneath an insulated envelope (for ambient specimen section). Frozen specimens are packed inside a 6 x 9″ zip-style biohazard bag, including an Aqui-Pak™ segmented absorbent pouch that holds up to four tubes, and placed in the small insulated cooler (ID: 8 x 6 x 8”) with the appropriate amount of dry ice. Ambient section includes 6 x 9″ biohazard bag and Aqui-Pak™ segmented absorbent pouch plus an ambient gel wrap to maintain the temperature environment. 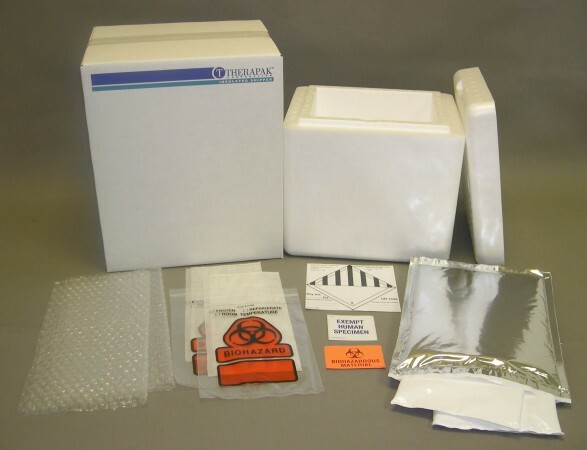 System includes: cushioning material, Exempt Human Specimen label, biohazard label, and dry ice label.